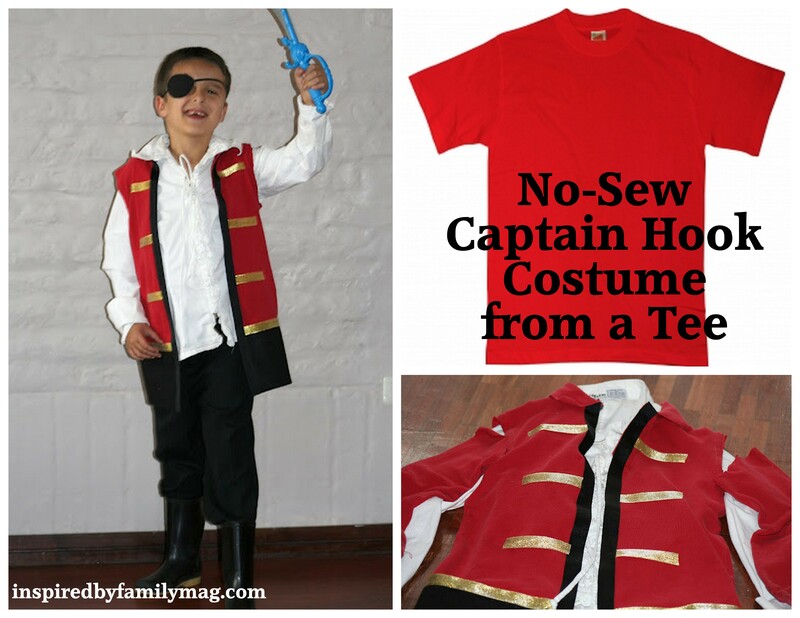 How to make a No-Sew Captain Hook Costume From a T-Shirt! Nothing like last minute work to get your creative juices flowing. It was the day before their Halloween party and we still had not discussed the costumes. When I asked them this was their responses: Captain Hook, Peter Pan and a Pirate. 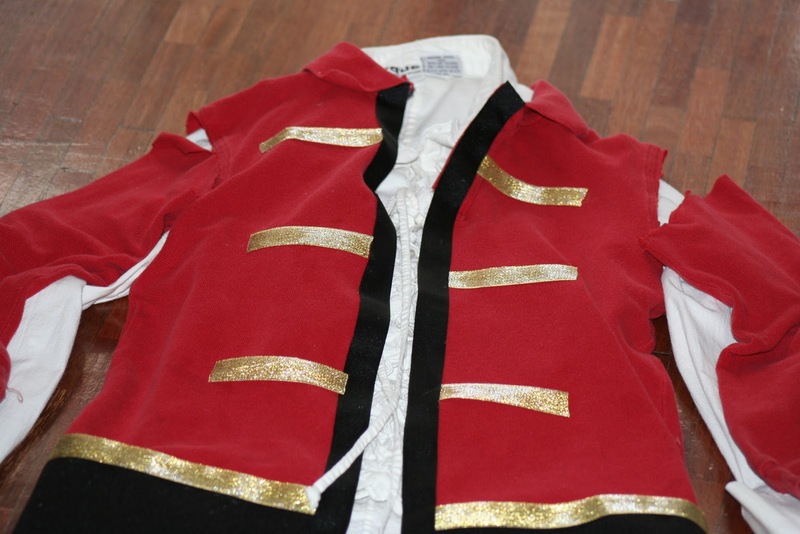 I had no time to sew nor was I in the mood, this is what I came up with for Captain Hook. After the party, it went into their costume bin and it still gets used for their pretend play. If you are new here and you don’t want to miss our fun posts follow us via Facebook, Twitter or email. It’s easy and cost effective! You may find a few affiliate links below for your shopping convenience and I get a tiny portion of the proceeds, which helps keep us up and running! What you need is a T-shirt you don’t mind cutting up. 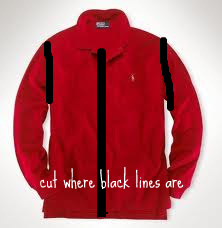 You can also use a polo shirt. 1. 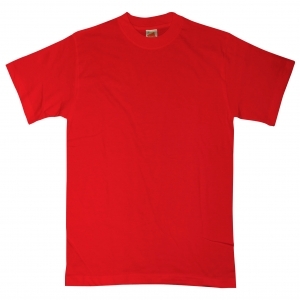 Cut the tee as shown in the picture above. Down the middle and cut the sleeves off. 2. Use the black felt and cut out a long rectangular shape. This will go around the bottom of Captain Hooks coat. Then glue using fabric glue or silicone glue. Glue the black felt to the bottom of the t-shirt. 3. Then glue the black ribbon down the middle of both sides. This gave it a more clean look and it covered up the raw cut edges. 4. Next add gold ribbon and glue it over the bottom where the black felt and the t-shirt meet. 5. Then glue small strips of gold ribbon down the middle of the coat as shown above. This captain hook costume took me about 20 minutes to complete. You can also use a hot glue gun if you don’t have fabric or silicone glue. The pirate hat was a bit more complicated for me to make and my son didn’t even end up using it, blah. 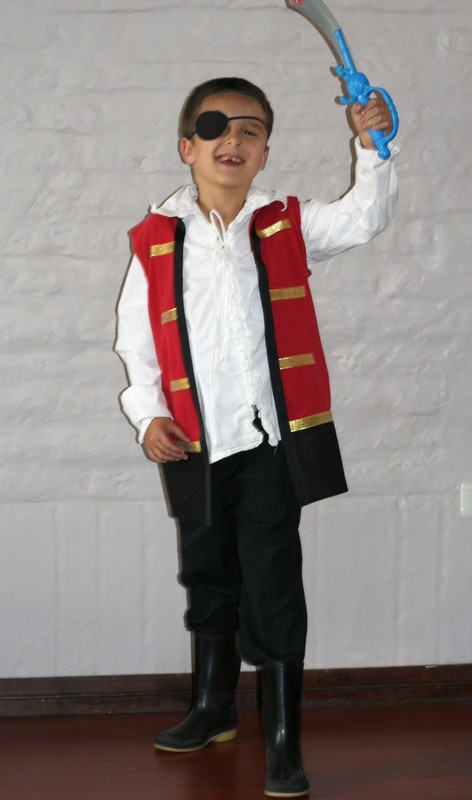 No Sew Peter Pan costume here! Halloween Finger Food– Easy Recipe! That is so creative and cute! I could have never come up with it. Thanks for sharing this with me. Adding it to my list now! oh how cute and simple!!!! I LOVE it!!!!! 🙂 Thank you so much for the sweet idea and for linking up at Happy Hour!!! This is a great costume idea. I love the look and how easy it is! Oops–I guess it’s not a jacket. It’s a shirt. Still fabulous! That is fantastic! So simple and it looks amazing. I think I’ll make one of these for my son’s dress up cabinet. Pinning! Oh my goodness I totally made this for my brother who was visting from out of state and wanted to fit our family theme it turned out amazing! Although I used permanent double sided tape to put it together because I didn’t want to mess with glue. Thank you so much!!!!! Where do you find long prices of felt? I love his idea!!! So simple and looks amazing! Jenna, thanks. You can find it at your local fabric store and sometime Walmart carries it.